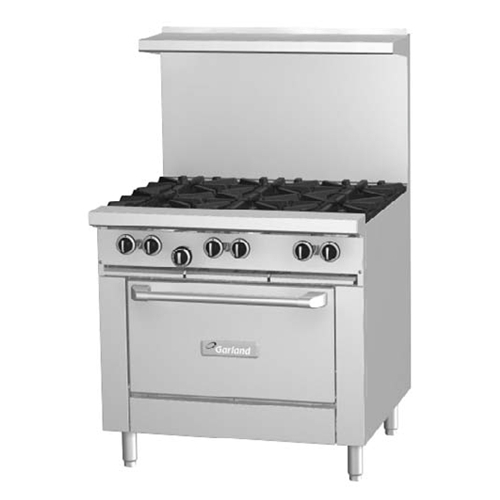 Available in Natural Gas or Liquid Propane, the Garland G36-6R stainless steel six-burner range boasts convenience and durability. With six powerful cast iron grates this Starfire Pro Series professional model offers a whopping 33, BTU. A standard size oven with anything but standard features; it includes a cast iron “H” style 38,000 BTU burner and three position nickel plated oven rack to accommodate sheet pans in any direction. Not ready to be served yet? No worries, the Garland G36-6R’s wide temperature range can hold your cuisine until you're all set. The Garland G36-6R: A 6 burner range ready to handle the toughest food service environment.